Milky Way Swirling Pinwheels - Universe Galaxies And Stars Section. Swirling Pinwheels Near the Heart of the Milky Way. Image credit: Peter Tuthill (Sydney U. ), Keck Observatory, Donald Figer (RIT). Astronomers have gathered new data on a formation of stars called the Quintuplet cluster. 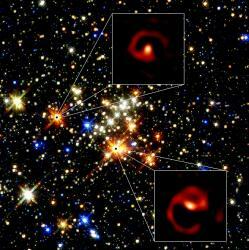 These are a group of stars near the supermassive black hole at the centre of the Milky Way. The new data comes from the W.M. Keck telescope, which gathered high resolution images of the stars. They appear to be massive binary stars near the end of their short lives, which are giving off huge amounts of gas and dust. These dust plumes are creating pinwheel-shaped spirals around the stars as they orbit each other. Quintuplet cluster. For the first time, scientists have identified the cluster of Quintuplet stars in the Milky Way’s galactic center, next to the super massive black hole, as massive binary stars nearing the end of their life cycle, solving a mystery that had dogged Astronomers for more than 15 years. The nature of the stars was not entirely clear until now. In a paper published in the Aug. 18 issue of Science, co-authors Peter Tuthill of the University of Sydney and Donald Figer of Rochester Institute of Technology show that the Quintuplet cluster consists of young massive binary stars that produce large amounts of dust. Their data reveal that five bright red stars are nearing the end of their "short" lives of approximately 5 million years. These quickly evolving stars burn fast and bright, but die younger than fainter stars, which live for billions of years. The study captures the Quintuplet stars just before disintegrating in supernovae explosions. Using advanced imaging techniques on the world’s biggest telescope at the W.M. Keck Observatory in Hawaii, the scientists captured the stars at the highest attainable resolution for the instrument, far exceeding the capability of the Hubble Space Telescope, which imaged the cluster a decade ago. The extra-resolution gives scientists a new glimpse of the dust plumes surrounding the stars and the swirling spirals Tuthill likened to pinwheels when he identified the first one in 1999 elsewhere in the galaxy. "Only a few pinwheels are known in the galaxy," Figer says. "The point is, we’ve found five all next to each other in the same cluster. No one has seen anything like this before." According to Figer, the swirling dust in pinwheel stars is key to the presence of the most evolved massive stars and points to the presence of pairs of stars. The geometry of the plume allows scientists to measure the properties of the binary stars, including the orbital period and distance. "The only way that pinwheels can form is if they have two stars, swirling around each other. The stars are so close that their winds collide, forming dust in a spiral shape, just like water sprayed from a garden hose of a twirling sprinkler," Figer says. "A single star wouldn’t be able to produce the dust and wouldn’t have the spiral outflow." An earlier study by Figer in 1996 claimed the Quintuplet cluster consists of evolved massive stars that produce dust. Figer’s research could not be confirmed until now with the use of the Keck telescope. "If you want to understand star formation, you have to understand if they are forming alone or if they have partners," Figer says. "The answer gives us a clue as to whether stars form alone or with companions." Other scientists involved with the study include John Monnier of University of Michigan, Angelle Tanner of the Jet Propulsion Laboratory, Andrea Ghez of University of California and William Danchi of NASA Goddard Space Center. Grants from the Australian Research Council, the National Science Foundation stellar astronomy and Astrophysics Program, and the NASA Long-term Space Astrophysics Program supported this project.